For a quick intro to what happened, check out Paul Lancaster's blog for TechNorth. For more details read through Stuart Childs's fantastic working with water blog. For details and links to what happened check out Simon Redding's hackpad. Or if videos are more your thing, John Popham's produced 23 for you to watch on the #FloodHack16 YouTube playlist. Two weeks after the event, I want to move discussion beyond what happened and start sharing what's happening next. A good place to start is by looking at how flooding analysis works currently, how it is beginning to change, and where I think it's going. 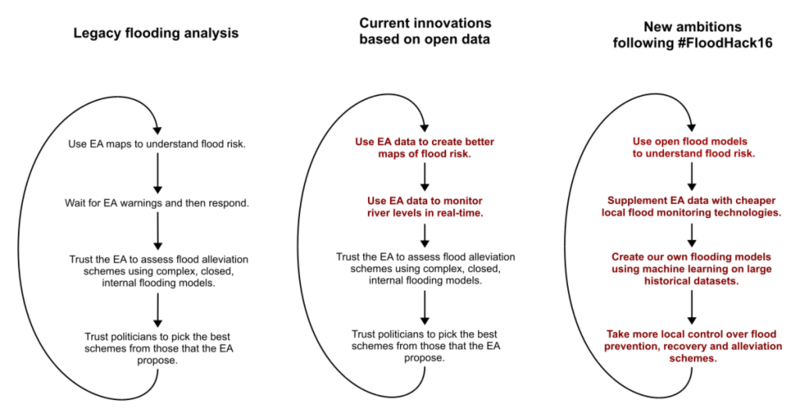 More recently the environment agency have started releasing open data. It's already being used fantastically well by companies like Shoothill whose maps of flood risk and real-time flooding alerts hugely increase the number of people accessing knowledge that already exists. But these advances are just the first of many improvements that open data will allow. At #FloodHack16 I think we saw a glimpe of what's coming next. When I wrote about SimFlood I didn't imagine that we would make this much progress so quickly. From almost nothing, we have built ThingsLeeds, an open and free network that will allow us to monitor river levels in Leeds. But it's the clearer picture we now have for how to proceed that's most exciting. We're already making progress. If you'd like to join in, we'd love to have you. Contact me at @thomasforth.